CCTV helps add another layer of security to your home. 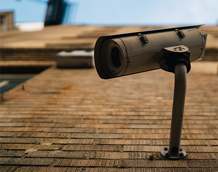 If you have an ADT security system installed and a motion detector triggers the alarm, your CCTV can provide footage and evidence of what has caused your alarm. With the availability of cost effective, reliable and fast home internet options, the ability to view CCTV video from a remote location has become a viable option. ADT employs a highly trained group of operators that in the event of an alarm, can view live CCTV footage at your premises to help determine what caused the alarm. and loved ones and acts as a visual deterrent to potential intruders – sending a clear message that nothing goes unseen. CCTV can be setup for both indoor and outdoor so you gain more insight into what has transpired on your premises. Servicing Victorians for 20 Years! The best affordable security alarms for all Melbourne homes and businesses! It has never been more important to have the latest home security alarm systems for your house to keep your family safe and secure. Don’t wait for an invasion to occur to implement the best security systems for your home or business premises. You deserve the best protection, and we can provide you and your loved ones with exactly that. Purchase an alarm system from Melbourne’s best home security alarms provider. Since beginning our operations in this industry many decades ago, we have gone above and beyond to ensure outstanding results for every customer, which is reflected by the great testimonials we receive. All of our technicians are fully qualified and will thoroughly install all of these appropriate security measures to wherever you need. Every one of the systems recommended by our company has undergone careful testing to ensure they fit perfectly with whatever application required of them. We will tailor match and install a system that fits your property perfectly, giving you peace of mind and a much more secure feeling overall. Have your home security system installed by an experienced qualified professional!